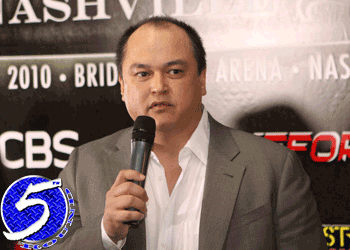 Scott Coker and Company will be invading the “Lone Star State” today to promote “Strikeforce: Houston.” The company CEO will be joined by light heavyweight champ Muhammed “King Mo” Lawal, Bobby Lashley, Tim Kennedy and KJ Noons. Today’s press conference will go down at 2PM CT inside the Toyota Center in Houston, which is the home of the NBA’s Houston Rockets. “Strikeforce: Houston” will take place on August 21st and will be headlined by a 205-pound title bout between newly minted champ “King Mo” and top contender Rafael “Feijao” Cavalcante. In addition to the championship affair, a new middleweight king will be crowned when Ronaldo “Jacare” Souza takes on Tim Kennedy for Jake Shields’ now vacant 185-pound belt. It was originally believed Strikeforce would hold an eight-man tournament to anoint their new champion following Shields’ pending defection to the UFC, but it appears Strikeforce brass feel confident either of the co-main event participants would do the company proud. Bobby Lashley will also be in action, however it is currently unknown who the former WWE superstar will face in his second bout under the Strikeforce banner. Former EliteXC lightweight champ KJ Noons returns to the cage following his successful outing at “Strikeforce: Los Angeles” last month. The boxer/MMA fighter is expected to face former UFC vet George Gurgel.